The content management system is a matter of personal choice. There are free options which are used by millions of users worldwide to build websites. 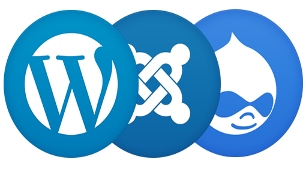 Massey Web Design is proud to host WordPress, Joomla, and Drupal installations and provide users with multiple resources to facilitate the management of their websites. WordPress is web software you can use to create a beautiful website or blog. We like to say that WordPress is both free and priceless at the same time. WordPress is used by millions of webmasters worldwide for building their website or blog. The core WordPress software is built by hundreds of community volunteers, and when you’re ready for more there are thousands of plugins and themes available to transform your site into almost anything you can imagine. Over 60 million people have chosen WordPress to power the place on the web they call “home” — we’d love you to join the family. Drupal is a free software package that allows you to easily organize, manage and publish your content, with an endless variety of customization. Drupal is open source software maintained and developed by a community of over 1,000,000 users and developers. It’s distributed under the terms of the GNU General Public License (or “GPL”), which means anyone is free to download it and share it with others. This open development model means that people are constantly working to make sure Drupal is a cutting-edge platform that supports the latest technologies that the Web has to offer. The Drupal project’s principles encourage modularity, standards, collaboration, ease-of-use, and more. Massey Web Design can work with you to decide which content management system is best to suit your needs. We are proficient in designing, developing, and managing all of the above content management systems.